I heard so many great things about Infusium 23 that I just had to make a purchase (in my pre probation days). Infusium 23 is supposed to strengthen your hair and it can be used after a perm, color process or other chemical treatment to revitalize your hair. When I go to my salon for a touch up I see Infusium on the counter and one of my stylists just loves the stuff. I purchased the original Infusium23 in the brown and white bottle to see how my hair would benefit from the product. After trying it out the first time I said to myself" at least this junk only costs $6.99", my hair turned into exactly what Infusium is supposed to remedy. My hair was dry and brittle, now I understand that Infusium is protein so your hair will need some moisture after it is applied but it seemed like it needed way more moisture than I could give. There are other forms of protein that I could apply to my hair which won't leave my with a dry mess. Now you would think I would have learned my lesson right? Nope. I then purchased the moisturizing version of Infusium23 and that was a little better than the original pro vitamin formula. My hair was not as dry but it was still dry enough to get on my nerves. I had to mix it with other products just for it to work on my hair properly. This single paraben Infusium23 product and all of the various formulas of Infusium must be thrown into the "SKIP IT" files. I do understand that different products work for different people so I want to hear from you. Have you used this product? If so what were your results? I don't know when it all began but I have always liked the scent of apples, cupcakes and other delicious treats. I don't need roses or perfume that smells like roses but I will take a pound cake scented body wash any day of the week..lol I know it's a bit out there but I just like the scent of edible items. That is not to say that I want to walk around town smelling like bbq chicken but there is something about having a scent that can make my own mouth water that makes it all worthwhile. One line that has delivered when it comes to high impact scents is 100% Pure. As denoted by the name this company produces pure products that are 100% vegetarian and 100% natural. 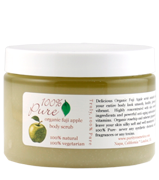 Recently I purchased the $22.00 Fuji Apple body scrub which smells like the most crisp, sweet green apples you could envision. "Ingredients: Organic Cabernet Grapeseed Oil, Organic Rosehip Oil, Evaporated Cane Juice, Vitamin C (ascorbyl palmitate), Vitamin E (a-tocopherol), Pure Apple Aroma, Organic Lavender Honey, Extracts of Grapefruit Seed, Green Apple, Cherry, Blueberry, Pomegranate, Raspberry, Blackberry, Cranberry and Rosemary"
I mean really does it get any better than this? To layer your scent remember to try the body butters and lotion. I found the facial wash to be a bit too strong for me but the purifying seaweed facial mask was pretty good also. Have you tried this mascara? Did it work well for you? Extra Info-I checked out the new Sephora nail polish colors by OPI and I concluded that there were maybe two standout colors for me. You can easily find duplicates for all of the other colors. Remember when I did this post about the instant manicure by Avon? Well I saw similar nail strips at Sephora, the only downside is that all of the strips were in like a dusty metal color. Cantu Shea Butter leave in Conditioning repair cream is a custard- like product that is supposed to stop split ends, reduce breakage, as well as moisturize and protect your hair. You are even advised to put the product on your hair 3 days prior to getting a relaxer because it is supposed to protect your hair from any damaged potentially caused by the chemical process. After applying the cream to my hair one thing that I appreciated was that it is a light product and a little goes a long way. Once I did put it on my hair 3 days before my relaxer and I didn’t notice any breakage but I usually don't have that problem anyway so I don't think I can fully attribute that result to the shea butter. For roughly $5.00 at your local beauty supply store this isn't a bad deal since it is paraben free and the main ingredients include shea butter and soybean oil. It also promises shine but i feel that the shine does a disappearing act after a few hours. Have you tried anything from the Cantu line? How do you repair your hair when it gets damaged? Do you simply cut it off or attempt to treat it? Update- I started my probation Aug. 3rd and this is my final week. What I failed to mention is that during this time I also curtailed my eating habits which means I wasn't spending money on products or food...can you say stuffed wallet...lol. This process really gave me an opportunity to see where I spend most of my money so that was great. Oh any I've lost weight for sure..yay. What's your dream hair length? While some women dream of luxuriously long hair others just want to have hair long enough to allow them to wrestle it into a simple ponytail. Whatever hair length needs or wants you may have there are countless products that promise to help you to reach that goal. One such product is the Stimulating Gro Serum by VIA Natural, a product that contains rosemary, vitamin B, aloe vera and other ingredients. This mint scented serum is similar in consistency with the natural sebum that every human produces so it is a little thicker than water (pretty light with a little oil mixed in). You are instructed to use this on your scalp twice a day to stimulate your follicles and produce the growth of stronger hair that grows at a faster rate than usual. It really does seem to melt right into your scalp effortlessly and while it is on your roots that is fine but please don't let it get on your hair. I was rolling my hair and used this product on my hair as I was rolling and the next day my hair was rock hard. I had to saturate my hair in order to comb through it, it was disastrous. Regarding growth I can't say that I experienced anything extraordinary if it did anything it was minimal at best. I would say skip this $7.99 hair hardening treatment because better products exist. This product is thrown into the "SKIP IT" files. May of you have been contacting me about growth aids so I will try to post on them on a more consistent basis. Sorry for posting so late everyone...busy week. Once you couple those words on the label of a product it is almost a certainly that I will buy it. Those two word are indeed found on the label of the $10.00 J/A/S/O/N Satin Shower Body wash. With aloe vera, chamomile and Echinacea all in one product I knew I was in for a treat. I don't know how many of you have ever tasted Echinacea but the taste is really not pleasant in fact there is a distinct scent with all three of the aforementioned product so I wondered how this product could claim to be fragrance free. Well I was so pleased that it did not have a medicinal or minty smell, but that is not to say that it is truly fragrance free. While in the shower I had to sniff it a few times just to make sure I was attributing what I was smelling to the right object. Unfortunately I was right, this product smells just like the bubble that you give kids to blow. I just thought that was a bit odd for a body wash, I would much rather a nice scent than a product that has a scent similar to dish washing liquid. Other than that this is a regular body wash although it claims to be well suited for people with sensitive skin. Update- I think I am doing well on probation, i have not purchased a thing and many of the items that were on my freedom list (the product I wanted to get right after probation) have been scratched off. I would much rather use what I have in my home as opposed to needlessly spending money on items just on a whim. I would estimate that I have saved roughly 400 on product (probably a little more) so probation isn't bad. I will curb my spending after I am off probation. We all want beautiful skin, so when I saw Clean Energy by Origins I was intrigues. It promises that the vitamin E in the cleanser will help your skin to retain moisture while the olive and sunflower oils help to gently remove dirt. The product is literally a bottle of oils, aside from the aforementioned oils the ingredient list continues on with macadamia oil, fruit oil and even some oils I had never heard of. When you wash your face the oil turn into what looks like milk. I think this cleanser made me break out, I don’t think I need any more oil on my combination skin. Maybe this product would work well for someone with dry skin. For $18.50 you can get a 6.7oz bottle. If you have used an oil based cleanser how did it work for you? What type of skin do you have (normal, dry, combination)? I both love and hate this scrub! I love it because it really makes my skin feel smooth and the ingredients are great. Talk about natural ingredients, this Nubian Heritage scrub in Raw Shea includes the following: soy milk, vitamin E, frankincense &myrrh (may contain-brown sugar, sea salt, honeysuckle cocoa butter aloe juice, lemongrass oil and a list of oils that continues down to the end of the ingredient list.) Not one harmful ingredients in sight, this is an all natural product with certified organic ingredients. And the scrub does work. When I was buying this scrub a sale associate raved about this product, in fact she dragged me over to the counter and introduced me to the product (the Nubian Heritage counter wasn't even her section). She said " I love this scrub, but I let all of the oil run off before I use it." This scrub has a layer of oils just hanging out on top of the scrub, I've seen this before in scrubs so it wasn't anything new to me. I decided to keep the oil and scoop it up with the product as I scrubbed in the tub. The scrub leaves your skin oily, almost to the point where you don't need lotion after leaving the shower. This could be a good or bad thing depending on your personal taste. The only problem is that my skin does not respond well to too much oil so just below my collar bone I broke out. Nothing too terrible remained on my skin but it was a bit unsettling since I am a v neck shirt kind of gal. Anyway it quickly cleared up and I haven't used the scrub since, but I will use it again. I think for my skin I just need to drain off the oil as the woman mentioned because it may be a little too much for me. This scrub is priced at $22.00. I found this company as Macys but you can show online through their website. Take a look at the other scrubs available through NH. Any certified organic products not work out for you? Have you ever tried anything from Nubian Heritage? Do you prefer scrubs with or without the oil? Now on to the makeup portion of this post. Oh my goodness, I am on probation and a blogger named RENREN is killing me..lol She posted her new MAC haul and a lipstick in the color bing is a must have for me. Since I really don't wear makeup, (I'm a minimalist at heart) I would probably tone down bing on my lips or mix it with a lighter color so that it's still dark but not as dark however I LOVE it. It looks awesome on you Ren. Please check out the video to see some of the new colors. I am salivating over bing and the first lip glass that Ren shows on the video. I mentioned in a previous post that a few weeks ago I was all signed up to get a MAC makeover on Aug. 22nd once their hot new line launched. I now know that the line must be the Cult of Cherry and now that I have seen bing I don't think I will go, gee whiz it will probably make me break probation..lol. MAC sent a little card to my home announcing the new line and there are at least 3 lip products that I need/want. Will you get anything from the new MAC line? One thing that really disturbs me is when my products go bad before I am done using it all. So when I was younger and my nail polish would get goopy (technical word) instead of throwing it away I would simply pour some nail polish remover into the bottle. The problem with that process is that it was a hit or miss, sometimes the polish was restored to it's natural state while other times it became a thin and runny. A product that has yet to fail me is my nail polish thinner which I purchased from Sally's for roughly $2.00. You just pour a few drops into your bottle, give it a little shake and your polish is as good as new. LOVE this product. What do you do with your polish that gets a little hard? Any suggestions? Update-I walked into Target yesterday and I left without buying a single product. I did purchase one magazine but I don't count that as a product ;-). One thing that helped me to get through it all without stocking up on items that I don't need is by sampling tester products. There was an aisle with Giovanni products, and I tried the hydrating raspberry lotion, whoa it really had a nice scent. I think I will have to get that product when I am off probation..lol. My gown is almost the color of the third one from the left (Illusions-"delight "). Here are a few of the looks that I created but I would love to hear from you which colors should go where on my lids. In the next photo I am wearing both of the Illusions eye shadows, the lighter color is on the bottom portion of my lid and the darker color is everywhere else. Here I am wearing M.A.C magnetic fields and Illusions Cosmetics in dolce vita. Also I think I will go with dramatic lashes on the big day. On the left eye I am wearing Revlon lash fanstasy (left) which I posted on previously and on the right I am wearing Covergirl Lash Exact (I will review that at the end of this post). The Covergirl Lash Exact is one of those mascaras that promise longer lashes with no clumping. Yes, it has a smooth application and it will lengthen your lashes without clumping but you will not get any extreme length. As you can see from my eye on the right you really can't see my lashes too well. This mascara is decent because I like that you don't get clumping; however, when it comes to delivering length, this mascara is just average. Priced at $5.99 (or less) you can find this product at your local drugstore. VO5 on my hair? NEVER that is until I kept seeing all of these posts online about the big CVS sale on VO5. I decided that I would at least look at the bottle in the store then check out the ingredients then make a decision on whether or not I would buy it. Since I do not use sulfates on my hair I was only interested in purchasing the conditioner. After reviewing the ingredients list I found aloe leaf juice, soy milk protein and biotin on some of the bottles. I had never even cared to look at the ingredients list because I thought a cheap conditioner would never work well on my hair. I have been using V05 in my pre poo process and it isn’t horrible. I don't think it is the best conditioner, not by a long shot, but for the price tag and the ingredients included it is pretty good. I felt like my hair was a little softer and moisturized after using this cheap conditioner so I may continue to buy this product in the future. I paid $.75 at CVS and I don't recall seeing this conditioner priced any higher than $1.99. Which cheap products work well for you? P.S. Do you see why I'm on product probation? I couldn't just buy one or two V05 bottles could I, no I needed to stock up. (By the time I had taken this picture two bottles were already used). Here is another edition of "battle it out" where I make products go head to head for my money. I wanted to see which products would make my hair really soft and silky so I used two products on my hair at the same time. I know that is probably a prescription for destroying my hair but hey no bad results so far and this is not something that I do often. I separated my hair into sections and used the following products 1)Redken Extreme Rescue Force and 2)Mizani MoisturFuse which is a moisturizing conditioner. Redken Extreme Rescue Force is a "fortifying treatment for distressed hair". I hate when I barely understand the ingredients list, that can't be good right? I do however recognize three different types of parabens, which is bad news in my book. The treatment is supposed to protect your hair, reinforce cuticles, repair any damage, while making it more manageable and shiny. You may remember an old post where I went on a mini vacay and stumbled upon some great sales and got some products for free, well this is one of those product. (the price tag on the product says $14.95 which is probably a discounted price because this purchase was made at JC Penny.) The Mizani MoisturFuse, also from JC Penny, is priced at $11.96 and promises to "revitalize" and moisturize dry hair. It is supposed to improve in the area of softness, prevent breakage and protect against split ends. This product weighed in with one paraben. Both the Redken and Mizaniz products include wheat protein. It may not seem fair to compare a treatment with a conditioner but they all claim to rejuvenate and strengthen dry hair so I wanted to put them all to the test. Results-- First place prize must go to Redken. The Mizani product was a mess, my hair felt tough and brittle, it is not easy to have hair that feels brittle when you are still in the shower but Mizani managed to do the trick. My Mizani experience was so bad that I had to rewash that section just to make my hair more manageable. I would repurchase the Redken product if it were not for the parabens, I just won't do it to myself. I know there are some Mizani lovers out there so please share what you love from the company. Which products had to battle it out for your money? Which product won? I will let you in on a little secret, some women want their hair to grow and they will go through non traditional measures to get that growth. A line of products exist for horses that women have been using to make their hair grow. I knew immediately that this product would never touch my hair but I still followed the progress of some women and they indeed experienced growth, fast growth. One of the popular bottles mentions that it will make your animals coat shiny and the HOOFS will grow much faster. I kid you not, when I read that I just about passed out. Personally I think my hair grows at the normal rate (about 1/2 inch each month) and I'm happy with that but as you know I started taking biotin to see what other results I could gain in a healthy way. Everything seemed to check out so I decided to give Ovation at least one try. I washed with the shampoo and it has Sodium Laureth Sulfate (also found in your typical body washes and hand soaps) which I stay away from but I wanted to use the entire line to get a feel for the product. After using the blue shampoo of death, my hair felt completely stripped, I mean like one of those cars you may have passed by on the street that sit high atop bricks no wheels no car doors, nothing, just a shell of what it used to be. My hair was NAKED! In short, I hated it and knew that I would never use it again, it was squeaky clean which actually isn't a good thing, you never want your hair to be stripped of all it's natural oils. Then on to the cell therapy product which I kept on my hair for over an hour (that is for intense treatment) and then the final product called the cream rinse. When I washed it all out, I almost headed back to the shower to drown my hair in Aveda damage Remedy but I decided to ride it out to see what mess my hair would look like, I wanted PICTURES of the disaster. I had the hardest time parting my hair which the company promised would be soft - NOPE rough and tough. So I didn't part my hair I just tried to separate it as best I could and roll it, it may have been the sloppiest rollerset I have ever done. SOrry to keep making Aveda comparisons but once I use Aveda I can part my hair and it is really soft, so easy to get through even when I am weeks and weeks post relaxer. I sat in rollers waiting for it to dry and as it dried it became SHINY and SOFT. HUH? How di d that happen? I was really surprised. End Results- Never will I use the shampoo again but I will use the cell therapy to see if it makes it grow faster (my little test) in between my regularly scheduled Aveda washings. Aveda has done for my hair what no other product line has done, so I will be a loyal customer but I am not afraid to try new things every now and then. The next day my hair was soft, shiny very bouncy and my curls held up very well. Have you ladies tried Ovation? What is the worst hair product you have ever used? Any reviews you would like to share? During a post on Friday I mentioned that I would put myself on product probation. During this period which will last for who knows how long, I will not purchase any products until my supplies completely run out. This product free period would allow me to catch up on all of the posts that I am backed up on as well as allow me an opportunity to get more space since my current product area is EXPLODING. I was so proud of myself because I knew that I had everything that I could possible need in my home so I didn’t step foot into a store. I didn’t make a single product related purchase all weekend. Hey probation is going to be a breeze I thought, until I remembered that on Saturday I placed an online Aveda order. I ordered the Aveda Pure Abundance Volumizing shampoo and conditioner since Just Wondering raved about it in one of the comment sections on my blog. I don’t even need this so why do I feel the need to try it, I am so annoyed with myself. I also ordered the large Damage Remedy treatment even though my current supply is more than half full. Then I made my way over to drugstore.com to order that Giovanni cocoa body scrub that DE and Justme spoke about. Probation is no walk in the park, but in true Frugalista style I may document how much money I am saving by not making as many purchases as usual. I have only said a million times on this blog that I usually don't like the smell of perfumes because they all seem to be too strong. I generally rely on well scented body butters and lotions to keep my body scented throughout the day. However, I will use a Victoria's Secret body spray from time to time. They now have a new scent that I sprayed on my way out of the store. I enjoyed the scent to much that I had to do an about face and head toward the register to make my purchase. I bought the shower gel $8.50, spray $9.00, and lotion priced at $9.50. I haven't purchased it in years but I used to really enjoy their pear scented line. What is your favorite VS body product? I will encourage you all to get samples if you can, because they can really give you a nice introduction to a product which will help you to determine if you need to make that purchase or not. For months I have had a sample of a Amazing Grace by Philosophy, it is a thick perfumed body butter. Last week I finally opened the sample and I fell in love with the scent, to me it is a cross between carpet freshener and a clean new baby. Ok maybe my description is a bit off but it smells good and normally I don't like the scent of perfume because I can smell all of the alcohol in it but such is not the case with this body butter. It includes cocoa butter and mango butter to give you a really thick yet creamy moisturizer. N ow when it comes to moisturizing your skin for a long period of time it is pretty good but don't expect a shine because it has a really matte finish; however, your hands will feel smooth for a long period of time. I went to Sephora to get the $28.00 5oz tube (shown on the left). They have a smaller tube available. When you are in stores, especially Sephora don't be shy to ask for your samples, you never know what you may be missing out on. I know that many of you have been using MAC for years but I am still being introduced to the wonders of this company. However I made a makeup blunder by selecting two lip colors that make me look like I am foaming at the mouth. I decided to remedy this problem by blending the colors in with my trusty chestnut brown MAC lip liner. In the picture above you will see my first eye liner by MAC in and the lip glass on the left is "Revealing " (it is also on my lips in the picture to the left) and the other is "Chai"( also shown on my lips on the right). Arm swatch (revealing (left) chai (right). If anyone has other suggestions on how I can make these colors work, (by mixing with other colors etc. ) please let me know. I was told by a MAC associate that an amazing new line will be out in August. She has already signed me up to go in and see the new products on August 22nd. I am not sure if I will really go but that will be based on whether or not I like the new colors once I see them on the MAC website. I also purchased some Biotin pills from GNC for $9.99. I have 600 mcg and the bottle contains 180 tablets. If you take a "one a day tablet" or anything like that, you will likely see biotin included in your daily intake but I just wanted to try biotin by itself as I try to track any changes that I may notice. Biotin is a part of the vitamin b complex and it is used to help break down fatty acids in the body. As the bottle says it is also supposed to support healthy skin, hair and nails. I don't think I will have the biotin related breakouts on my face that some women have reported because I am taking a low dosage as opposed to those who pop biotin pills like they are candy. If I do have any problems, I will not take any more. Have you noticed positive results from using biotin? And I will update my blogroll this weekend I have not forgotten about you!